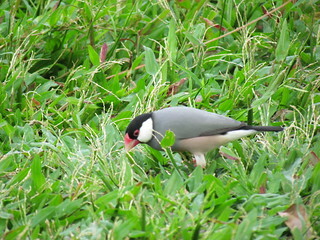 With full bellies, we stolled down to Iolani Palace, where we sat under giant trees, admired the outside of the palace and watched all the adorable little birds! 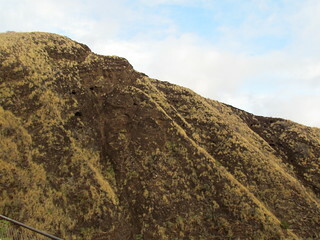 It is also close to the King Kamehameha statue at Aliiolani Hale. Somehow, we then walked all the way down to Ala Moana Center, a giant outdoor mall. Somehow it didn't seem that long at the time, but having just this year caught a bus from Downbeat Diner to the mall, it seemed like a long way from the bus! There we bought a bunch more Tokidoki Unicornos (series 2) and Ashleigh got a whole lot of Cheetas and I got a whole bunch of different ones! 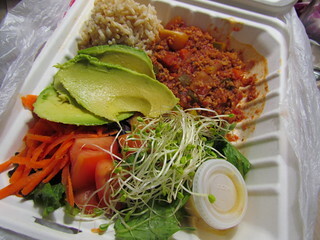 After our heavy lunch, we were after a lighter dinner, so we wandered up to Greens & Vines, a raw vegan place. 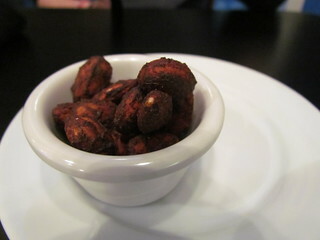 They gave us some teriyaki almonds to start, and I ordered some Tangerine Iced Tea (yum!). 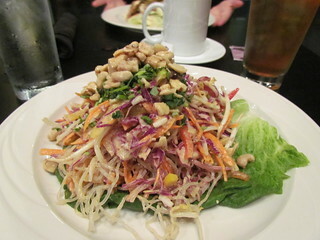 I had the Raw Pad Thai, made with kelp noodles (which I love!). Unfortunately this was riddled with shredded capsicum (yuck), so I had to spend a lot of time picking it out, but then it was great. 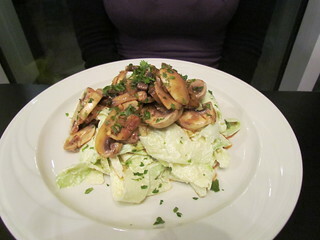 Ashleigh had the Zucchini Fettuccine Mushroom Carbonara, which was nice as well. The next morning we got up early (again!) for another tour. I will just make a short PSA: I had bought a Heart Thrive Lemon Poppy Seed bar that I ate for breakfast and it was really gross. Do not buy these, ever. 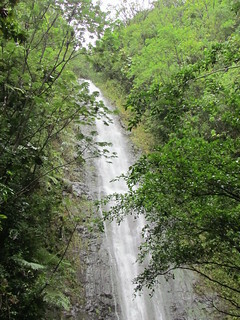 We were back with Oahu Nature Tours, this time to take on Manoa Falls. This is a stunning walk. The person at the hotel just booked us in to it, and only later did we realise that this was a 'moderate hike' with mud and slippery slopes. But they gave us some walking sticks and, even though it was pretty squelchy and slippery at times, and the last third was mildly terrifying, it was gorgeous! You will have to hose the mud off your shoes before you get back on the mini-bus, so you may want to take a spare pair of shoes. Do it! After some very long, hot showers, the only place we wanted to head to was Downbeat Diner. 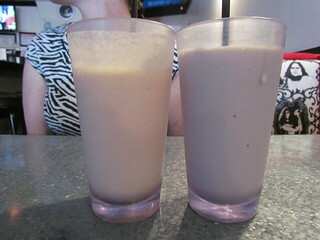 Ashleigh couldn't say no to the peanut butter milkshake again, and I tried the blueberry milkshake. Ashleigh had an amazing Breakfast Sandwich with Litelife Bacon, which is definitely the best processed vegan bacon I have ever tried (I prefer tempeh bacon to processed bacon generally). I had the Teriyaki Burger with Curly Fries. Best ever! After lunch I went to the Shiatsu Massage Center for an hour long lomilomi massage that was the most painful and intense massage experience of life. I may have almost been sick a few times. But it did get rid of my shoulder knot that I have had for the last million years! It is back again now, but it was all gone for a few months! 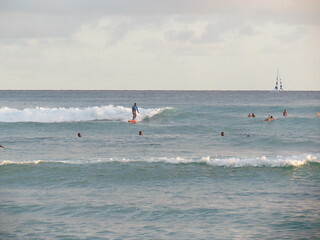 In the evening we went for a walk down to Waikiki Beach, which was quite crowded but quite lovely. In the evening, the sun goes behind the buildings and the beach is in shade, which means that even I could have gone swimming at the beach! Though I didn't. 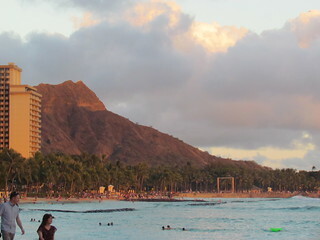 A truly lovely sunset walk, you can see all the way down to Diamond Head. Dinner was back at Ruffage. 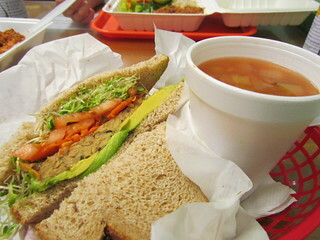 Ashleigh had a chilli dog, and I had the tempeh and avocado sandwich with a cup of vegetable soup. The next morning we were up early to go to the airport and catch our flight home to Brisbane. I came home with a suitcase full of Tings, Justin's Dark PB Cups and all sorts of treats and trinkets. A magnificent trip! 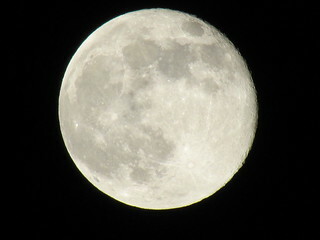 We arrived into Honolulu late at night, to be greeted by this glorious moon! 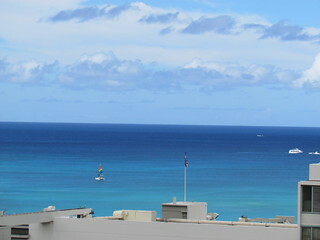 We had arranged a shuttle to take us to our hotel, The Miramar at Waikiki (currently closed for renovation). We had a few snacks on the plane, but we were starving. There was an ABC Store just across the road from the hotel (in fact there seems to be one on almost every block! 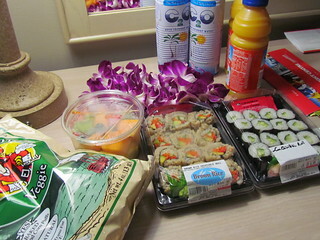 ), and thankfully we were able to stock up on some sushi, juice, fruit and chips. The chips are from the same people who make the amazing Tings, but these were awful. Don't be tempted! The next morning with booked some tours for the next couple of days before seeking out some breakfast. 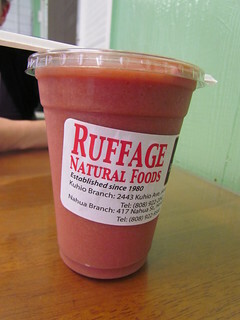 Thankfully, Ruffage Natural Foods was just a few minutes walk away. 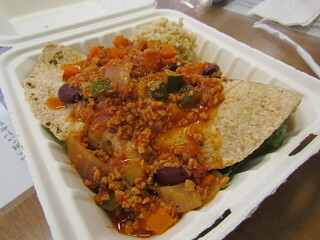 This little cafe and health food store wasn't anything fancy, but it was satisfying. 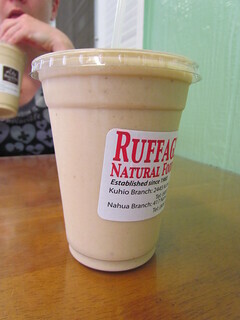 They have a large range of smoothies, and I couldn't say no to a Peanut Butter Banana Smoothie. 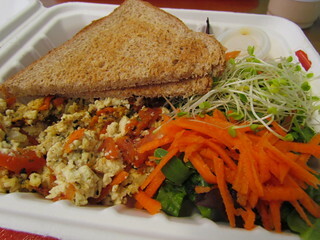 I also had the veggie tofu scramble with toast and salad. Our hotel was not beachfront, but if you peered through the buildings you had a pretty lovely view. After a quick hotel stop, we caught a bus out to Kahala Mall for one of the most important parts of the whole entire trip. 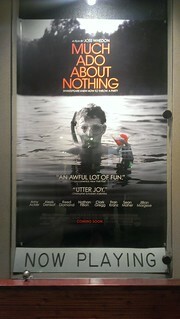 We went and saw Much Ado About Nothing at the movies! I love Joss Whedon, and I love Amy Acker and Alexis Denisoff and Nathan Fillion, and I love Much Ado About Nothing. And this hadn't been released in Australia yet. I was so excited to see it! And I love it! Loved it, loved it, loved it! The excitement of seeing the movie worked up an appetite. 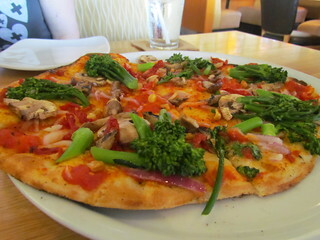 Thankfully there was a California Pizza Kitchen there, and they will bring you a menu with all their vegan options. 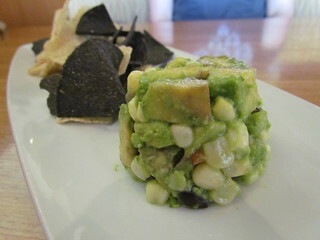 We had some White Corn Guacamole with Corn Chips (needed a higher guac to chip ratio), and a California Veggie Pizza (with the thin crust and ni cheese). Dinner found us back at Ruffage for takeaway. 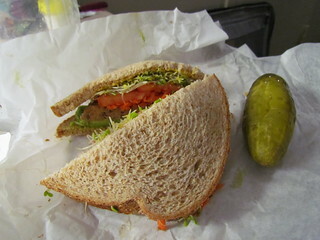 Ashleigh had a Tempeh and Avocado Sandwich with a Dill Pickle, and I had the Vegan Special (veggie mince, rice, salad, avocado). We took it back to the hotel and watched trashy movies. Delightful. The next morning we were up super early to go on our first tour! 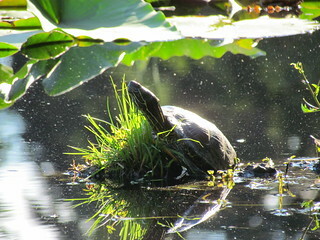 We went with Oahu Nature Tours on both our tours, and I cannot recommend them highly enough! 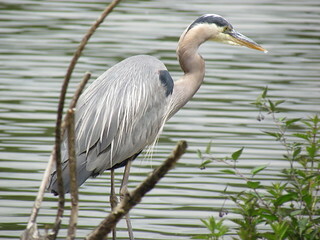 Fantastic guides who are full of awesome information about nature! 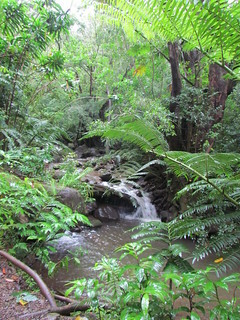 On this morning we were off to Diamond Head, which is a fantastic hike up to the top of this beautiful park. I am so glad we went with a tour group rather than on our own, there is a bus you can catch there but it drops you off ages away from the start of the hike! None of that for us. We were on the 6.30am walk, and it was a beautiful, cool, slightly misty morning. Perfect for this sun-phobic red head! 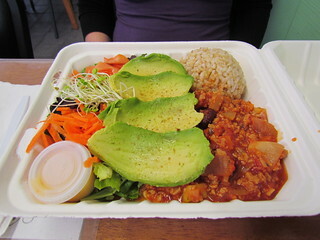 After a much needed shower it was back to Ruffage for a Super Antioxidant Smoothie, Vegan Chilli Bowl and Vegan Burrito. After this we went to The Royal Hawaiian Shopping Center so Ashleigh could do some shopping. Then we caught a bus downtown to the most magical place of all! 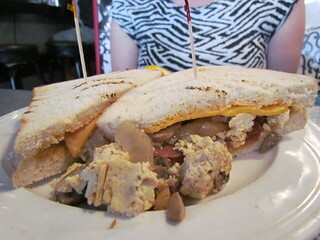 The place, Downbeat Diner, an amazing diner where they can make almost everything into a vegan option! 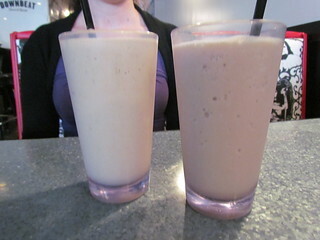 Like these milkshakes - one peanut butter and one chai. 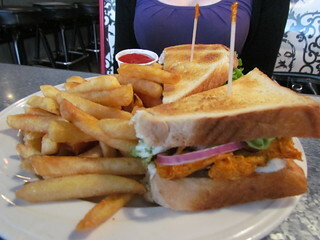 Ashleigh ordered a Buffalo Sandwich with Fries. 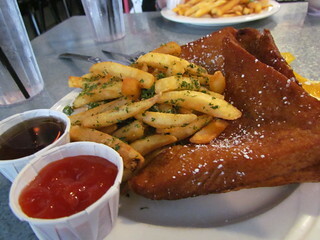 I had a Monte Cristo with Garlic Fries, as I had long heard of Monte Cristo sandwiches. 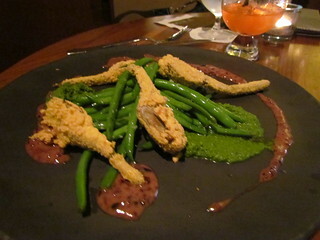 This was an very fried affair, as you can see! A bit too fried for me. The monte cristo comes with some maple syrup, which was good but odd right next to garlic fries and ketchup!. 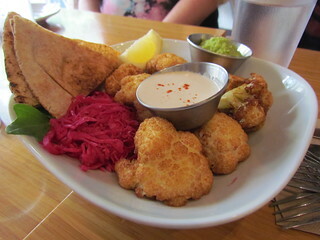 But it was all pretty amazing, perfect junky food. Nom! Ashleigh and I met up with some of her friends back at Nuba for lunch and then exploring. 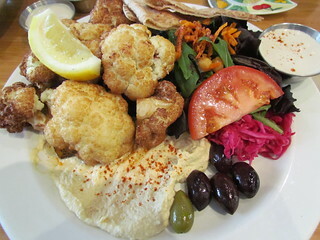 Cauliflower featured pretty heavily on my menu, with a Najib's Special starter (crispy cauliflower and tahini) followed by a Najib's Special plate (cauliflower, hummus, salad, olives and pita). They make really good cauliflower. 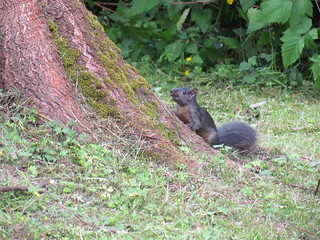 With a tummy full of cauliflower we made our way to Stanley Park for some nature time. 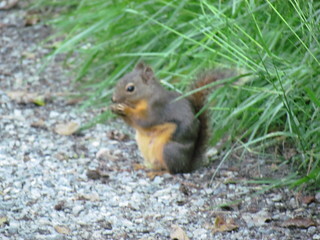 We visited Lost Lagoon, Prospect Point and Beaver Lake and saw lots of lovely wildlife, as you can see. Sadly I didn't see any actual otters or beavers (I would have exploded with squees), but it was enough to know that they were there even if I could't see them. One day, my little loves! 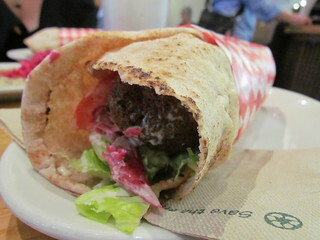 Dinner found us back at Nuba where I had some Cauliflower Soup, Baba Ganooj and a Garden Falafel Pita Wrap (with hummus and avocado). On the way back to the hotel we stopped by What's Shaken, a milkshake bar that has vegan options, but they were sadly out of vegan ice cream that evening. The next morning our usual staple of Agro Cafe was closed, but we had passed a JJ Bean and I had heard that they had vegan baked goods. 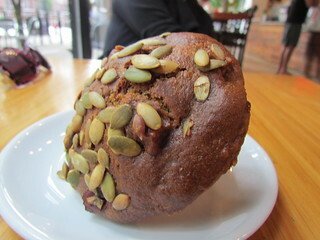 They delivered with this Pumpkin and Apple muffin and a soy chai. 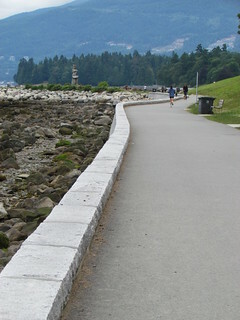 Afterwards we walked back up to English Bay and down the Sea Wall back to Sunset Beach. It really is a lovely area. 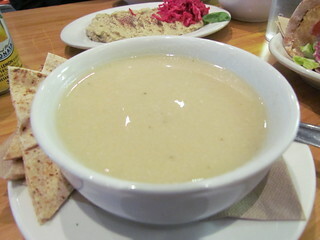 We were leaving Vancouver that evening, so had to go back to Zaatar for one final go at perfect hummus. 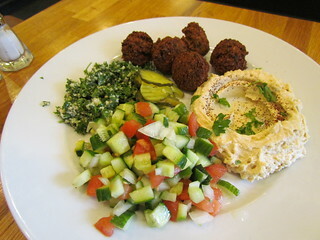 Ashleigh had the falafel plate again, and I had the Green Hornet, which had hummus, coriander, chickpeas and mushrooms. Perfect. Then it was a taxi to the airport (where I ran into an old neighbour from Sydney!) and off to Hawaii! 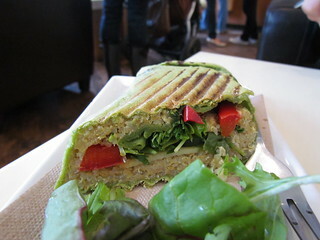 The next day started with a grilled Quinoa Wrap and a chai from Agro Cafe before we went and did some exploring of the downtown area. 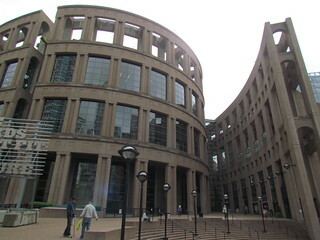 The Vancouver Public Library is a remarkable building to behold, and is full of wonderful books. A great place to lose yourself for a while. 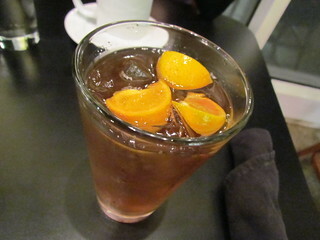 I loved it there! We also took a brief stop past the Vancouver Art Gallery, though there weren't any exhibitions on that were exciting enough for us to part with our money, but we enjoyed their fun gift shop. 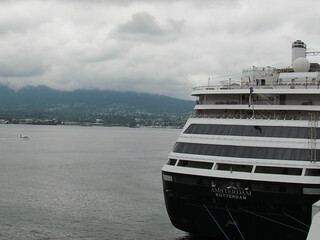 Canada Place is the famous waterfront where all the cruise ships come in. 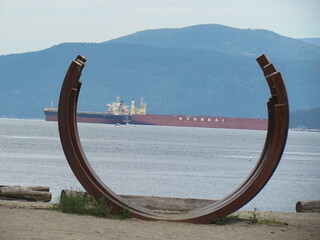 It is a lovely place to stroll around, checking out the giant ships and the pretty views. 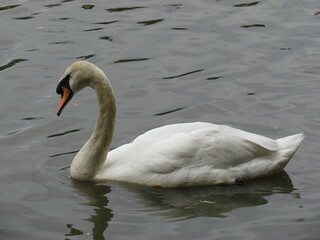 It was a pretty grey day when we were there, but there was still something just lovely about it. Canada Place is a short walk down into Gastown, where we saw the famous steam clock and poked around in some shops. 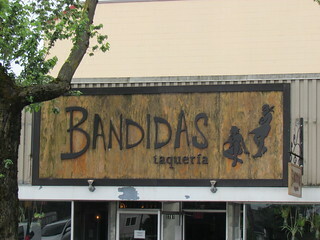 However the main goal for our day was to get out to Commercial Drive (via the skytrain) and try out Bandidas Taqueria, a vegan-friendly place which we had heard so may amazing things about. It certainly lived up to the hype! 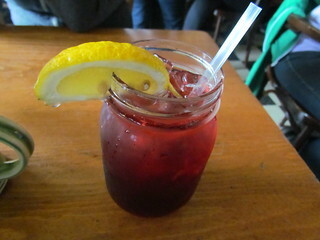 I had a really delicious hibiscus lemonade to drink, and for lunch we each ordered a huge baked burrito. 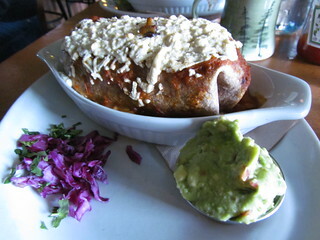 I had The Bobcat, which had potatoes, onion, cabbage, pinto beans, Daiya, sour cream and guacamole. 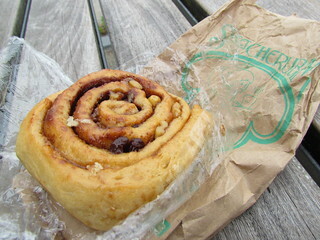 I tried to take an inside shot for you, but it wasn't pretty, however it was delicious. 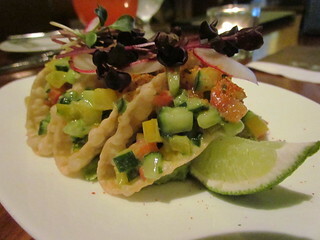 Ashleigh had The Wolf and Goat, which had pinto beans, guacamole, cabbage, Daiya and sour cream. I haven't heard a bad thing about this place, so if you are in Vancouver be sure to visit. They have great vegan options on the menu. After lunch we strolled down the great length of Commercial Drive to look at some shops. 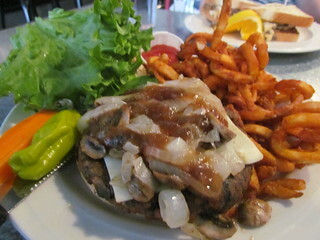 Commercial Drive has many vegan or vegan friendly places on it. 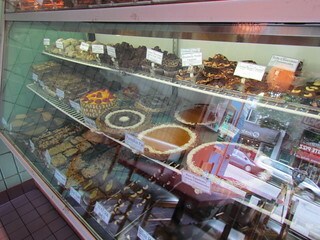 We also passed by Three Jewels and Deserts on our strolls. We stopped into Cafe Du Soleil (not to be confused with Cafe Deux Soleils, which we also passed on Commercial) as I had heard they had vegan baked goods but they had nothing. Woe. Though all was not lost, as right near there was Sweet Cherubim, a veg*n bakery and eatery, which is also right next to Drive Organics, a little natural food store. That entire case was filled with vegan goodies. 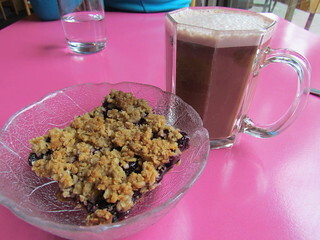 I selected the most amazing blueberry square (this was so good) and a Maya Chai. 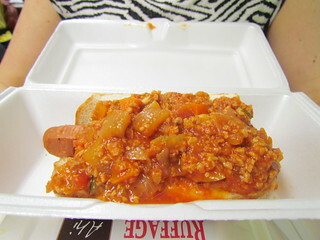 Then we poked around the food store next door and picked up a few goodies before heading back to our hotel. 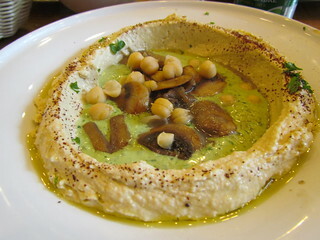 We had planned to get more delicious hummus for dinner, but alas it was closed! As it is now permanently closed... excuse me while I weep. So instead we found ourselves at the fancy Yew at the Four Seasons Hotel, which was meant to have some nice vegan options. And it did, though from my seat I could also see a large, decapitated fish that they had set a mirror up over for everyone to see. It is known as a seafood place, but surely something like that is off-putting to everyone? 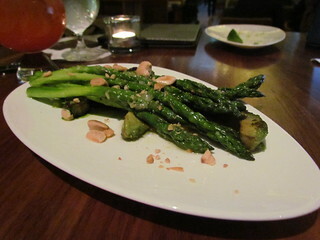 But onto the food, which was very nice (though small and expensive). 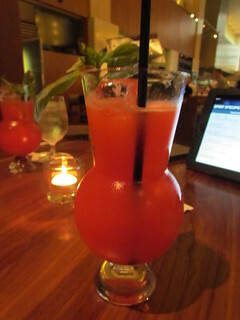 I had a great Strawberry Basil Vanilla Lemonade (I love American lemonade so much... no fizz and great flavours). They brought us out some Mini Tacos with Guacamole, Asoaragus with Green Goddess Dressing and Nuts, Crispy Artichoke Hearts with Beans, Basil Pesto and Tapenade, and Cashew Cream Mushroom Bucatini with Chili Cashews. 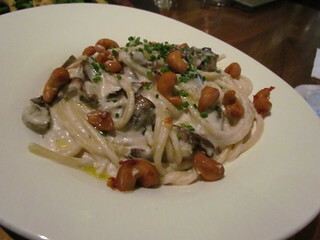 It was all great, but no surprises that the cashew cream pasta was my favourite. This was actually the nigth of the summer solstice, so we still had lots of daylight to stroll around in. So of course we watched Supernatural in the hotel room! 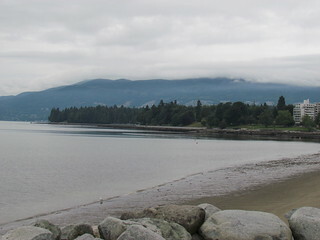 The next morning I got up before Ashleigh and went for quite a long walk down to English Bay Beach, then back down the Sea Wall to Sunset Beach. 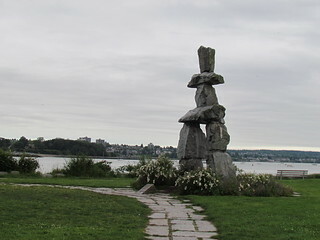 Up at the English Bay end there is a lovely monument called an Inkushuk, and I ate a cinnamon scroll I had picked up from Sweet Cherubim the day before. 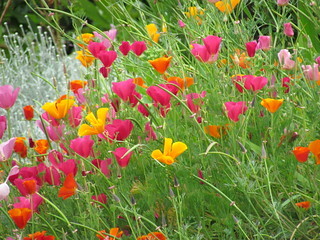 Then I spent a bit more time exploring the Davie Village and West End areas, including a gorgeous community garden in Davie Street with stunning flowers, before heading back to the hotel to meet up with Ashleigh for our next adventure.